Candidates for the priesthood must be able to discern a twofold call: a call to ordained ministry and a call to live the celibate life. Spiritual formation includes the cultivation of an authentic priestly life in imitation of Jesus Christ. This life includes celibacy, obedience, simplicity of life, as well as the cardinal virtues (Justice, Temperance, Prudence, Fortitude) and theological virtues (Faith, Hope, Charity). The spiritual formation program strives to establish a foundation within the seminarians for a lifetime of priestly ministry within the Church. This foundation is an intimate relationship with God the Father and Jesus Christ His Son through the Holy Spirit, a relationship nourished by prayer, Scripture and Tradition, celebrated in the sacraments, especially the Eucharist, and marked by a sincere devotion to Mary, the Mother of God and Mother of the Church. To this end, the spiritual formation program challenges seminarians to live in intimate communion with God through lives of celibacy, obedience, and simplicity of life to seek Christ in faithful meditation on the word of God and in active participation in the sacred mysteries of the Church, especially the Eucharist, Penance, and the Liturgy of the Hours; and to love and reverence the Blessed Virgin Mary (PPF, 107). Spiritual formation in the seminary seeks to lay the foundation for a lifetime of priestly ministry. During the years of seminary formation the aim is to establish the attitudes, habits and practices of the spiritual life that will continue after ordination (PPF, 110, 111). The Eucharistic Liturgy is the source and summit of Christian life and therefore the wellspring of priestly formation. Daily participation at Mass is expected of all seminarians. Ordinarily seminarians participate in the seminary community Mass, which gives expression to the richness of the Roman rite as well as the diversity of our ethnic traditions (PPF, 110, 116). Throughout the academic year various special liturgies are celebrated, in particular Byzantine Rite, Extraordinary Form, and Masses in Spanish. The seminarians must develop a profound appreciation for the richness of our spiritual and liturgical traditions. Instruction in the history and theology of liturgy, the spiritual life, and an introduction to spiritual classics is provided through courses in the core curriculum (PPF, 118, 119). For seminarians to seek to draw closer to Christ and live in intimate communion with Him, they must draw daily nourishment from the Sacred Scripture. Seminarians are encouraged in conferences and individual spiritual direction to form the habit of daily prayerful meditation on the Word of God (lectio divina). In addition, as part of the pre-theology formation seminar, new first pre-theology seminarians meet with the Director of Spiritual Formation to examine the basics of prayer, lectio divina, and the value of spiritual reading, as well as other topics related to the cultivation of the spiritual life (PPF, 110, 123). The Liturgy of the Hours sets the daily rhythm of prayer for priests. Seminarians pray Morning and Evening Prayer on a regular basis as a community. The men are expected to have acquired the habit of praying the entire daily Office by their second year of theology. They are encouraged to pray the Office (Daytime Prayer and/or Night Prayer) as a class, or in small groups, and with their fellow diocesan seminarians (PPF, 110, 117, 119). Seminarians who one day will be ministers of the Sacrament of Reconciliation must themselves learn to make fruitful and regular use of this Sacrament. The Sacrament is available at regularly scheduled times throughout the week, as well as by personal request. Communal celebrations of the Sacrament are planned and celebrated during Advent and Lent as well as during the annual retreat and weekend of recollection/Forty Hours Devotion (PPF, 110, 120). In order to foster personal devotion and love for the Eucharist, seminarians are encouraged through conferences and retreat days to spend one hour before the Blessed Sacrament, with the expectation that they will eventually adopt it as a lifetime habit of devotion. The seminary provides the opportunity for such prayerful devotion in the daily hour of Exposition of the Blessed Sacrament with Benediction (extended hours every Thursday evening), as well as during the monthly devotions to the Sacred Heart and at other suggested times throughout the year (PPF, 110, 124). Seminarians are expected to foster a personal devotion to the Blessed Virgin Mary in keeping with her unique role in the economy of salvation as Mother of God and Mother of the Church. In addition to a regular communal recitation of the rosary and weekly Novena to Our Lady of Perpetual Help, men are encouraged to join the seminary’s Legion of Mary, the Militia Immaculata (both of which are groups dedicated to prayer and learning more about the Blessed Virgin Mary and the work of evangelization), as well as to consider the annual opportunity to make a personal consecration to the Blessed Virgin Mary through the spiritual counsels contained in St. Louis de Montfort’s True Devotion to Mary (PPF, 110, 125). Formation for a priestly way of life in imitation of Jesus Christ will guide seminarians in learning the value, practice and cultivation of celibacy, simplicity of life, obedience, and pastoral service. These and other relevant topics are addressed through regular conferences by the Rector and the Director of Spiritual Formation, as well as through homilies, spiritual direction, retreats, formation advising, and formation workshops (PPF, 110, 122). Spiritual direction is a special opportunity for ongoing discernment, formation in prayer, and integration of personal, moral and spiritual growth. Seminarians are required to meet at least every three weeks with an approved priest spiritual director of their choosing in an atmosphere of trust and confidentiality. Spiritual direction is one of the foundational components of spiritual formation for all seminarians (PPF, 110, 127-135). In the external forum, formation advisors also guide seminarians in the setting of their spiritual goals. In their report to the formation team, formation advisors hold seminarians accountable for their overall participation in the seminary’s program of spiritual formation. This Formation Advisor Report addresses what is observable in the external forum such as whether the seminarian has an approved spiritual director with whom he meets regularly, his attendance at house spiritual exercises, his understanding of the Church’s expectations with regard to priestly celibacy, his manifesting a personal prayer life in general and especially with regard to setting aside time for private prayer as well as the Liturgy of the Hours, his devotion to the Blessed Virgin Mary and finally his understanding of and readiness to receive the ministries of Lector, Acolyte, admission to Candidacy, and Holy Orders. Retreats and days of recollection provide the time and place for sustained prayer, silence and solitude which are necessary for men to listen intently to the Word of God and grow in personal intimacy with the Lord. The seminary's schedule includes an annual five-day retreat for all seminarians at the beginning of the spring semester, a weekend of recollection with Forty Hours Devotion at the beginning of the fall semester, and a day of renewal at the beginning of Advent and Lent (fall/spring). Seminarians are also encouraged to seek for themselves periodic “desert days” of silence and abstention from electronic communication and entertainment. The Fourth Theology Holy Land Pilgrimage and Retreat is a requirement from which a man is exempted only at the request of his diocese or by the rector for a serious reason. The retreat takes place over Christmas break and counts as their canonical retreat. (PPF, 110, 121, 122). Opportunities for seminarians to gather for fraternal support, faith sharing, prayer and evangelization are available. In addition to the Legion of Mary and Militia Immaculata, these voluntary associations include the fraternities: Jesu Caritas, Friends of St. Joseph, New Evangelization Club, Blessed Frassati group, the Knights of Columbus, charismatic prayer groups, and the Mount 2000 youth retreat (PPF, 110). The Rule of Life contains further information regarding Spiritual and Liturgical life in the Seminary, as well as details on various Practices within the Seminary Community. Seminarians are to be men of prayer. They will form a habit of daily personal and liturgical prayer flowing from the celebration of the Mass, and including the Liturgy of the Hours, prayerful meditation with the Scriptures (lectio divina), and a filial devotion to the Blessed Virgin Mary (PPF, 110). They will incorporate into their personal spiritual lives the frequent reception of the Sacrament of Reconciliation and regular spiritual direction (PPF, 110). As men discerning the call to celibacy “for the sake of the kingdom of heaven” (Mt. 19:12) and as a stimulus to pastoral charity, they will manifest an ability to live chastely in mature relationships with others (PPF, 110; PDV, 50). They will be humble and obedient men of the Church (PPF, 110). In imitation of Christ who came to serve and not to be served, seminarians will value a simple way of life (PPF, 110, 269). 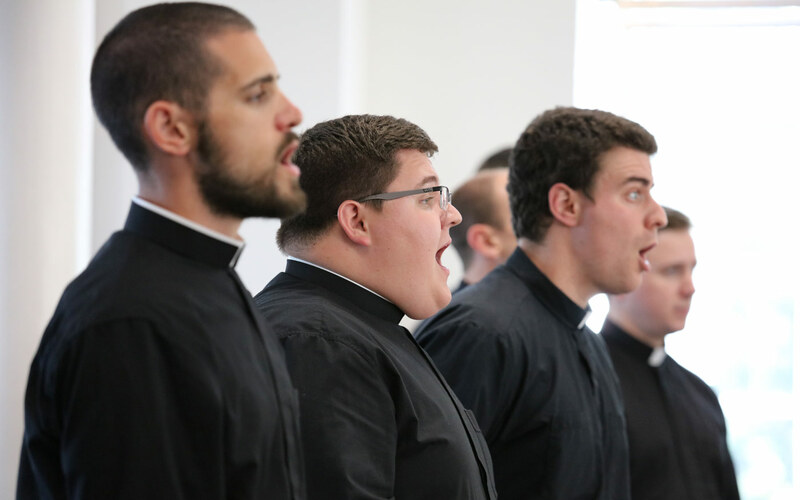 The Seminary Schola is one of the many activities our seminarians enjoy as a way to express their love and devotion to God through sacred music.